I will admit, the notion that Japanese cooking transcends sushi and sake bombing may cause quite the outburst. Even the plausible, emotionally charged refute. If your past Friday and Saturday night dinners have consisted of California Rolls and Sake-Sapporo combos, you might even take it personally. Beyond the customary miso soup and edamame, there is custardy, sesame gomo tofu waiting to be sampled. And to neglect the sweet and smoky charred shishito peppers would be the ultimate crime. Even the roasted nori - dark, briny seaweed that so often envelope your endearing rolls of nigiri zushi, are well worth the risk. At Kasadela, Yujen Pan does more than shine a light on Japan’s izakaya cuisine – he sets the stage. Opposite of what Masa, Megu and Jewel Bako are doing – offering seraphic meals fit for Japanese deities – Pan brings the playing field back down to realistic means. Back to a world where no dish costs more than ten dollars. Izakaya cuisine is essentially pub grub food in a more refined form. Traditional spots usually contain large, illustrated menus with a multitude of small, colorful dishes covering every square inch. The idea of the dishes is to, most discernibly, complement your mutually increasing beverage tab. To stimulate your palate, black edamame – a steamed and darkened version of the regular chartreuse-colored variety, offers a potently more pleasurable, salty savor. Whereas a triplet of crispy tori kawa – skewered, accordion-like chicken skins – make ordinary pork rinds seem like the last kid picked in dodgeball. Though I must confess, I would’ve cared for a tad bit more. The whole bar snack theme at times is cute, but at other times makes you wonder why the dishes have to be so small. I might even go on to say I built an impulsive addiction to the special of charred pork cheek, smothered in sweet, vinegary scallions. Yet after savoring the last drop of its fragrant miso-based sauce, I felt so used and forsaken. There’s a personal connection between each of his dishes. It could just be the concept that the servings are meant to be shared – like tapas, but only tastier. Each sauce and condiment is balanced and congruent, full of flavor and life. Each plate, served as soon as they’re prepared, complement those that precede them. Yet the ika sugata yaki, a grilled whole squid, was a bit rubbery and waxy. The light soy sauce, too weak to make up for the muted taste, yearned for the aid of a minced ginger garnish. A special of lightly grilled duck, served cold, was sleek and fatty. The ruby ribbons laced with smoky strips of fat worked well with a sour kimchee cabbage accompaniment. Though the duck’s richness was a tad shallow. The space inside is as compact as the dishes. 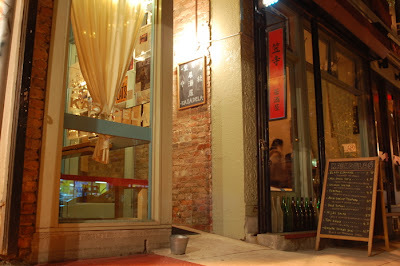 Situated on the entrance side rises a petite bar and extensive collection of sake; opposite through a door, is a small dining room consisting of no more than 20 seats. You won’t find any elaborate pan-global combinations or rude service here. It’s far too relaxed and friendly to worry about the high stress standards of big name restaurants. With its soothing brick walls and warm glow of tea lights, the tranquil place is meant to unwind in. After a long day of classes or when that desire for tiny, Japanese snacks crosses your mind, where better to rest than your local izakaya. By the time dinner’s complete, you might even be slightly rejuvenated - energetic enough to move on to the next step of the night, jäger bombing. 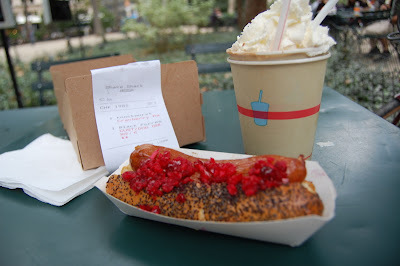 I won't lie: I have an affinity for Shake Shack. It's like the sibling I never had, the salt to my pepper, the chocolate to my vanilla. In more rational terms, Shack Shack has never before let me down. That was until orphan sibling Shacktoberfest came around. My trip to Shacktoberfest was in good spirits. A tantalizing, Bavarian-inspired menu had graced the Danny Meyer godsend for a short span on earth. I read about tales of Usinger's plump sausages, custard concretes that taste of Black Forest Cake and Sachertorte - even a sturdy selection of special Oktoberfest beers to polish off the meal. They have lederhosen screen-printed t-shirts. And cute little clay bier steins with 'Shacktoberfest' logos. Buy one of those and you even get a free filling of brew. How could anything so darling disappoint? It could've been the crusty, cardboard tasting buns. Possibly the lack of bursting tang expected from the cranberry-horseradish relish. The gloppy aftertaste of the Black Forest concrete. The concrete was agreeable, a step away from satisfying. It swirled and melted like a smooth, silky pudding. Crumbles of an Oreo-like crust were sprinkled throughout like little Augustus Gloops in a pool of milk chocolate. I could practically taste the curdles of heavy milk fats present in the oversized dollop of fluffy whipped cream. Yet this lingering, spicy coat of heavy chocolate taste stayed around after each slurp. It was more of an annoyance and distraction than a comforting, goodnight tuck. Lost were my memorable taste bud pleasures of cherry peels and baby blueberries that complemented the custard so wonderfully. Instead I felt guilty and gluttonous, stuck with the shame of ordering a dessert as a drink. Seeing I might as well delve into the 10-day specials, which include German, Cajun and Italian sausages - I took a chance with the Stuttgarter Knockwurst topped with the recommended cranberry-horseradish relish. 66% failure. The poppy seed roll was comparable to that of a dog toy. The relish was so dull I could barely taste the cranberry. Yet what saved the day was the gushing, tightly packed Knockwurst that could've been served by itself. Even with its pigheadedly thick and resilient lining, the struggle itself made it that much better - a true knockout, if you will. Around the compounds, there's a new addition of flat-screen Sanyos that play bizarre little videos on loop. Dogs dressed in suits, Shack Shake uniforms and garden workers - for some unknown reason - are the subject matter of these mind-numbing films. Could be an omen for the dogs' buns? In a way, my trip was a complete letdown. Possibly it was just meant to be - as an insight on Shack Shack's Achilles heel. Or it could've been an off day; the cashier didn't even know if they had Knockwurst. Whoever gets the blame; I'm sure it can be resolved. As long as they keep the Shack Burger and originals, all should be well. Just don't let the October-orphan sibling get between us. Since September 2006, the inhabitants of East Village have been blessed by a gift from the Far East. No, it’s not the Indian version of Dumbo, black market opium or Chinese firecrackers. Rather, it involves a much more edible and enjoyable import. Inside you’ll find golden delicacies - intricate works of art handcrafted with the utmost attention to detail. They glisten. They sparkle. They beg to be taken. 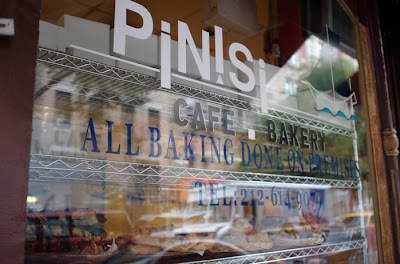 What I speak of is not illegal contraband, but instead of the pies, pastries, cookies and cakes of Andi Igusti’s Pinisi Bakery. Originally from Bali, Indonesia, he spent 20 years cooking around the world before settling in New York. He pulls influences from French, Italian and most prominently American baking styles. Pinisi, a reference to an old style of Indonesian fishing ships, plays as an ode to his homeland. His approach is simple and earnest, “I wanted to create a bakery of bold, basic tastes,” he states. Palmiers, rugelach, turnovers, muffins, scones and croissants are just the tip of his repertoire. On the glass pane window outside, it proudly claims “All Baking Done on Premises” – a creed he thoroughly stands by. “I bake it all by myself, it’s easier that way” he cheeringly says. If that’s what works best, please do continue. The croissants he bakes are perplexingly flaky and buttery on the outside, yet tangy and doughy on the inside. Enfolded by a delicate crunch, the yeasty interior offers a pleasant chew. 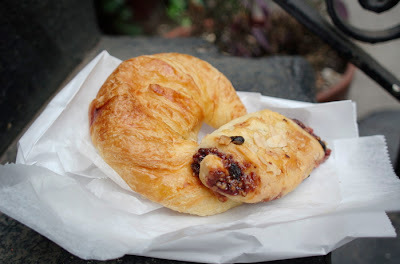 Sweet as honey and leaden as a brick, the raspberry Rugelach was like that of a Fig Newton upgraded thoroughly. Incorporating raisins, almonds and what tasted like bits of fig almost, it left a tingling on my tongue after each bite. Yet Igusti’s personal favorite, as is the customers’, remains the Red Velvet Cake. Available both in slice and cupcake form; it truly is unlike any other. In a case where Magnolia might opt for more sugar, Pinisi instead aims for a true, bold flavor. Paired with a rich cream cheese icing, the two combine for a wonderful balance. For $3.50 though, it seems supply and demand have made a noticeable influence. Nonetheless, the rest of his sweets – rainbow cookies, cannolis, blueberry crumb cake along with a hot and spicy chocolate dome reflect his broad range of talent. Filled with a dense, mousse-like interior, the dome is an original creation of Igusti. In terms of cakes and pie - pecan pie, carrot cake and a berry-topped cheesecake are just a tidbit of the flavors he cycles through. The crème brulee, is less of a thick custard and more of a sweet, vanilla pudding. Topped with a fanned strawberry and fragile sugar crust, the rich, eggy syrup inside was rather delightful. What was most noticeable though, is the dedicated neighborhood presence within Pinisi. Loyal patrons from just around the corner or down the street offered positive remarks and praise for the year-old establishment. Even an old woman by the name of Maria felt compelled to bring me aside and extol Igusti’s baked goods. Their treats may not have yet reached world-famous status, but there’s always the potential. After being around for one year, I’d say this quaint little place has done quite well without the support of a Carrie Bradshaw cameo. I suppose we’ll all just have to wait and see - whether or not one of those double-decker tour buses, eventually sails on over.